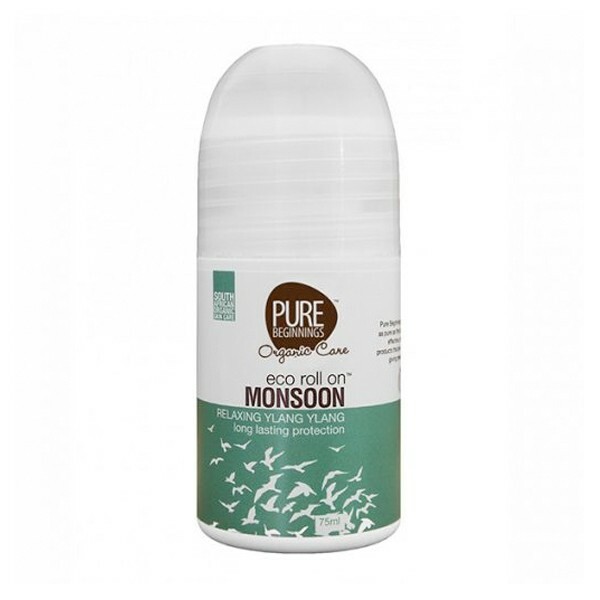 Eco Roll On – Monsoon (75ml). Ylang Ylang scented freshness, long-lasting protection, brought to you by Pure Beginnings. This delicately scented and ‘nasty’ free, deodorant inhibits the bacteria that cause odorous sweat. Pure Beginnings’ Eco roll on is gently scented with rose geranium, ylang-ylang and patchouli. Free of parabens, petrochemicals, sulphates and aluminium, it targets body odour causing microbes through the use of Sodium Bicarbonate, which is a natural antimicrobial. This product is certified Vegan and is Cruelty-free.